I finally added something to that wire basket on our entertainment center. It was shouting at me to fill her up. With some hemp ball accents. Nice and tightly wound with hemp cording. All snug in one place. I found some thick hemp cording at Wal-Mart in the craft section……or maybe it was with the jewelry supplies. I also found 4 inch styrofoam balls there as well. I started by smashing one end of the cord into the styrofoam ball, nice and flush with the surface of the ball………..so that I wouldn’t have a lump after I started winding. Do you see from the side that it’s pretty flat against the ball? Anyway, then I used a hot glue gun to start winding the cord around itself. I kept winding, only using a little glue at a time (maybe 4 or 5 inch narrow line of glue on the ball, right next to the cording), and then pressed the cord nice and tight to the ball. Sometimes I had to smash what I had, against the ball, just to keep a nice contoured spherical shape….. I kept winding, and kept it pretty tight. And made sure to keep the rows nice a close together. And then at the end, I wound up the last little bit without glue to see how much I would need, then snipped off the end. But make sure to have enough to tuck the little end piece under. And then glue and wind the last bit down. Smoosh it firmly in place to keep a nice symmetrical shape. Then I used spray paint to customize the color of cording on some of them. This is a great way to match already existing decor. Then tossed them all into that wire basket up on my entertainment center. Now my eye isn’t always drawn to that empty basket. Oh how awesome. I have bought various decorative balls for a bowl in our den. They have all, at some point or another, been picked up and dropped and smashed against the floor! Wouldn't hurt so much if I had made them myself so inexpensively! Thanks for a great tutorial! Oh I love this! I know exactly where to put them! Thanks!! Those are awesome! Thanks for the tutorial!! I love coming here and seeing what sort of project you've done. Great work! The colors you've chosen are beautiful! What is the blue color of spray paint you used? They look great. I'm going to have to try these. I love the idea of spray painting them. Ok, I might be a little slow but I'm wondering when you were winding and glueing were you glueing to the styrofoam or to the hemp? Does that make sense? Or were you glueing to both? Once again a perfect and simple craft! Thanks! I saw on Living with Lindsay, directions for dying twine. Spray painting it for this project is SO MUCH easier! 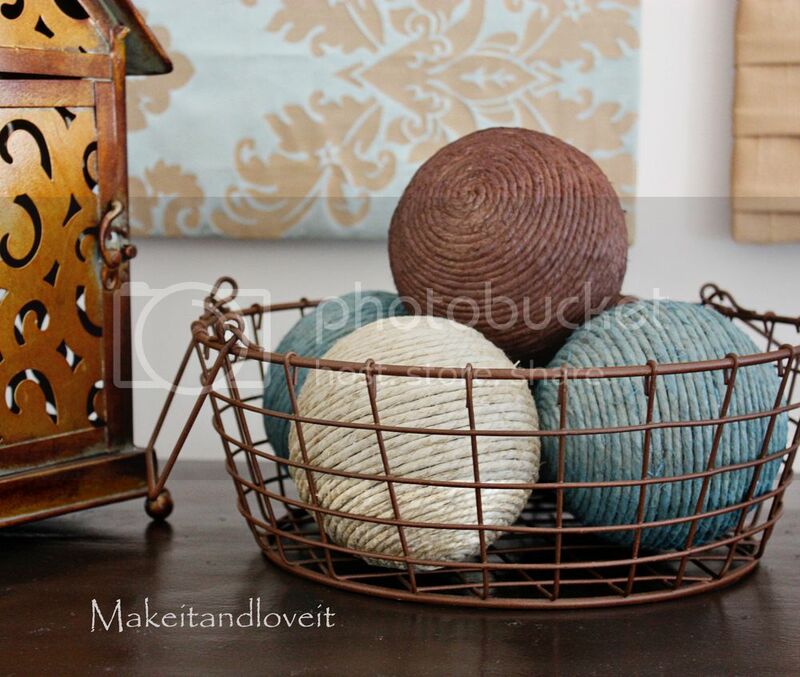 I have some black wire baskets above my refrigerator that NEED some of these balls! I always feel happy when I read your posts! Thanks for inspiring me!! I adore these balls! I have some hemp that is smaller in cording, I will see if I can do something similar! I am not using it for anything else! Awesome idea. Thank you for the inspiration! Thanks! I have been wanting some decorative balls for a glass hurricane I have on my dining room table but the ones in the store are so expensive. I love these ones and that you can paint them to match! I hope to make some soon! Oh, and sorry flutterby, the blue is Bahama Sea by Krylon. Hope that helps! Thanks for the name of the blue color. Do you remember the names of the other two? I’m just so in love with how the three look together. This is exactly the color scheme I want for my house! Thanks!!! What a perfect idea. I was IMing with my sister about it and we thought you could even add embellishments to the balls to spice it up even more. Either to the outside of the finished ball or smashed into the ball as you wind, winding around them as you go. SO CUTE! Fantastic! 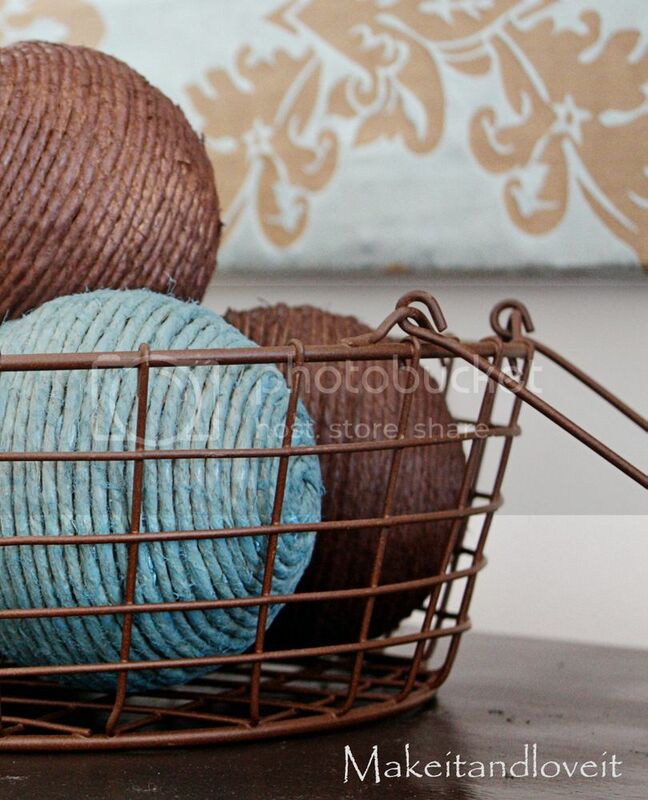 I saw these somewhere else recently done in greens and oranges… the colors you have done are the colors I am planning for the living room… NOW I am definitely going to make the balls after seeing them in the same colors! those look beautiful! i love how you painted them. thanks for sharing the great tutorial! So pretty! I have an entire roll of hemp. I think I feel a project coming on…. These are great! I have an empty metal basket that is just waiting for these! So cute….these balls are so expensive at the store. I wish I didn't have so many projects to do right now. I am going to remember this for later! 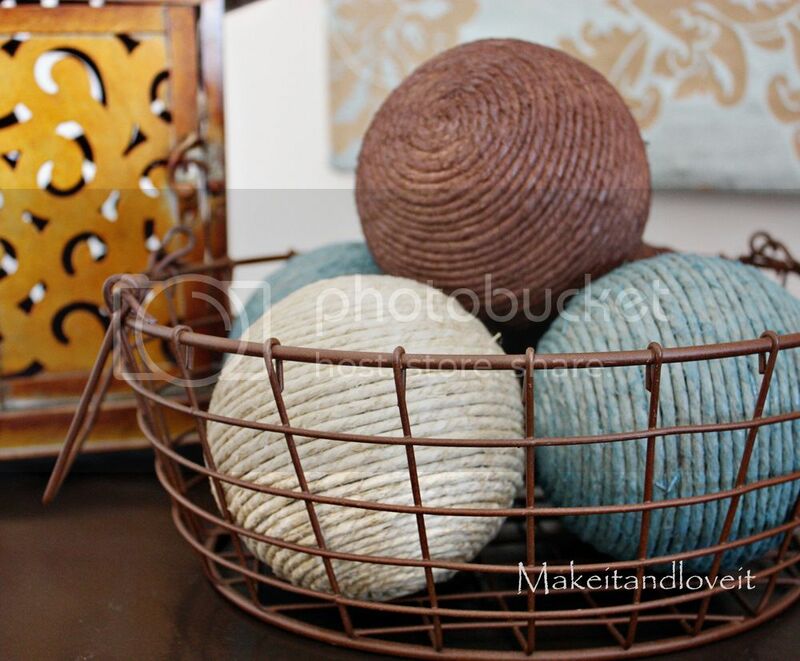 I've been looking for an easy project to fill a naked basket of mine. I think this is the winner! LOVE this idea! I am going to make some this week for sure! Thank you!! wow looks like something even i could do! love your blog!! Oh Ashley! It was like you read my mind. This is exactly the project I have been needing. I have a beautiful silver bowl in my living room that needs something in it and these are PERFECT!!!! Thanks a ton! To to to to cute! I just love them, thanks for the great tutorial! definitely going to have to try this. thanks for sharing! This is amazing! Great job and super easy instructions! I think me and the lil 18 month old I have will love putting these together. Mine with glue and hers with… I'm sure she'll just want to play with the balls! Thanks! Those are so cute! I think I'll have to give those a try. Thanks for the tutorials! oh so nice. looks great nesting in the basket. Those are great! I was actually going to make one today (before I even saw your post!) but those balls were $5 each at Michael's. Are they cheaper at Walmart? Great idea to spray paint the hemp. I would have never thought of that. Hepworths…..oh yes, walmart was much cheaper. I found the styrofoam balls there for $2-$3 for a package of 2. I saw them at Michaels too but couldn't bring myself to pay that much. whenever i saw those balls in craft shops, i always wondered what people used them for! now i know! they look so cute, wish i had the patience to do that many of them! they look great. These are amazing. We are looking to move and I'm a little nervous with all the empty spaces I will have, cause we have lived in an apartment for 6 years. :0) This will help! I love your creative style. My friend has a blog I think you will enjoy…. Love these balls! I would have never thought to spray paint them! God has given you such a gift fro being crafty (and thrifty too) !! I love that you enjoy sharing all your secrets! Thanks! How C.U.T.E!!!! Thanks for another cute project to add to my list! Must do this one soon! Very nice! I have done this before with styrofoam eggs and small pearls. I fashioned ribbon hangers for them and hung them on my Christmas tree, which at that time was Victorian themed. They were really pretty, but boy oh boy does that hot glue hurt when it connects with your fingers when pushing those little pearl strands into it! I've always been a little lerry of the decorative ball idea. But these, these I can get behind. Awesome! I need to see pictures of your whole house!!! I love this! it makes me want to redo everything in my house! Adorable! I was wondering, how much hemp is required for each ball? I just want to know how much to buy! I have an empty basket that I was going to do felted balls for…but these are dang cute too! I might have to finish it with clearcoat–I have kids that like to pick at things if they can…. I bought a big ball of it, and the label said 64.5 yards. I used about 3/4 of it for the 5 balls. Hope that helps! I love this idea! And seriously, the colors are the exact colors of my living room – how'd you know? Thanks for the idea! Let me join the others in saying how much I love this idea! If you are interested, I posted my take on them over at creatingbycami.blogspot.com. I really like it! I used this idea in my post and linked back to your home page and your tutorial. Ashley, it's been so long since I've come to your site but I'm glad I came and looked! So far I have made one of these and it turned out perfect! It's time consuming but very easy! Thank you for the idea! Oh these are so cool! I love that you spray painted them to go with your decor. So pretty & so easy, love it!